If you live in the DC area, you can look forward to a great lineup of events happening in the upcoming weeks. Pick from a variety of art exhibitions, plays and performances, and find out when the Nationals will be playing a home game. The Studio Theater in Logan Circle will present The Real Thing from May 22 through the end of June. The Tom Stoppard play examines the difficulties of marriage and the profound effect of art. 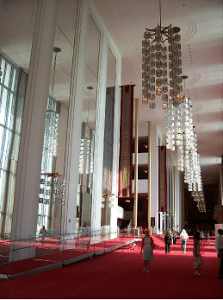 Residents of The Watergate are only a few minutes away from The Kennedy Center, which will present The Guardsman at the Eisenhower Theater from May 25 to June 23. Gregory Mosher directs this new translation of the Ferenc Molnar play. Earth, Wind & Fire is coming to the Wolf Trap Foundation for Performing Arts on June 4 at 8 p.m. Residents of Alta Vista are about ten miles away from this anticipated performance. Bike MS is happening at the National Harbor on June 8 and June 9. Support the cure for multiple sclerosis by making a donation or registering for the one or two-day bike ride. The National Gallery of Art, only a few minutes below Chinatown, will feature the exhibit A World of Bonds: Frederick Sommer’s Photography and Friendships on June 16. Sommer is known for his abstract take on the environment around him. The Natural History Museum, only a ten minute walk from the Clara Barton, will feature the exhibit Whales: From Bone to Book on May 25. Visitors can discover the process of creating scientific illustrations, using fossils, printing blocks and more. Additionally, the Natural History Museum will have Nature’s Best 2012 Photography Awards on June 7. The Freer Gallery will have the exhibit Sylvan Sounds: Freer, Dewing and Japan on May 28. This will feature the works of Thomas Dewing alongside Japanese art Charles Lang Freer collected in the late 1800’s. Take a look at the upcoming home games for the Washington Nationals. May 24 – Phillies – 7:05 p.m.
May 25 – Phillies – 7:15 p.m.
May 26 – Phillies – 1:35 p.m.
May 27 – Orioles – 1:05 p.m.
May 28 – Orioles – 7:05 p.m. The Millennium Stage at The Kennedy Center will feature a classical performance by YoungArts alumni Conrad Tao, Sirena Huang and Anna Litvinenko. The National Theatre, close to many Penn Quarter home buyers, will begin their Summer Cinema series on June 17, every Monday at 6:30. The series will start off with movies starring Jimmy Stewart. The National Museum of African Art near Mather Studios will feature the work of Roger Ballen on June 19. Admission is free.